Very competitive – contact Eunan for more information. Your opportunity to be part of a tight knit team responsible for the delivery of high quality Maternal Fetal Medicine (MFM) Services. Stunning natural attractions, coastal living and all without sacrificing the benefits of a vibrant, dynamic, metropolitan city. Beautiful new hospital with state-of-the-art facilities alongside courtyards, deck spaces and landscaped grounds. Over 160 education facilities including public and private schools, special education, TAFE and universities. Beautiful subtropical climate with warm winters and stunning summers. Diverse residential opportunities, with homes and apartments overlooking the ocean or canals, through to rambling properties in the hinterland areas only 30 minutes from the CBD. You will be part of a tight knit team responsible for the delivery of high quality Maternal Fetal Medicine (MFM) Services to women and their babies by providing a range of services including tertiary fetal diagnostic ultrasound, prenatal diagnosis, fetal therapy, antenatal care for complex pregnancies, pre-pregnancy counselling and perinatal loss/bereavement care. You will work with a team of highly skilled and dedicated health professionals including MFM specialists, midwives and sonographers to provide clinical care, education and research for all aspects of high risk pregnancy. You will have the opportunity to work collaboratively across departments, particularly with the Perioperative, Interventional, Emergency Department, Medical Imaging, Neonatal and Paediatric Surgical Services, and work as a member of the clinical team. Gold Coast Hospital and Health Service (GCHHS) delivers public hospital and health care services to a population of approximately 525,000 people in communities from the state border of NSW to the Coomera region of Queensland, with an annual budget exceeding $1 billion. GCHHS incorporates Gold Coast University Hospital, one of Queensland's largest clinical teaching and research facilities. Made up of seven main buildings and a total floor space of around 170,000 square metres, the hospital's design is extremely efficient and allows expansion to meet future health service needs of the community. State-of-the-art facilities to train the health care workers of the future. Courtyards, deck spaces and landscaped grounds for use by staff, patients and their families. Multi-storey public car park on-site with 2,200 car spaces. Gold Coast Rapid Transit (light rail) station in close proximity. Improved privacy and patient safety with over 70 per cent private rooms. Gold Coast Hospital and Health Service (GCHHS) is undergoing a transformation following the move to the Gold Coast University Hospital (GCUH) and the upgrading of the Robina Hospital. GCHHS serves a large population with a referral network that extends into Northern NSW. You will be part of a service that provides maternity care for around 4500 women, making it one of the largest public units in Australia and performs over 50 gynaecology operating sessions per month. Procedural Services, is undergoing substantial development and expansion. The Department has many services that have developed out of special interest for the generalists in both maternity and gynaecology.The Department of Obstetrics and Gynaecology is developing a tertiary focus which includes expansion of the recognised sub-specialities in Maternal Fetal Medicine, Gynaecology Oncology and Urogynaecology. Maternity services at GCHHS are located at GCUH. Gynaecology services are across both campuses, GCUH and Robina. The service currently has a certified subspecialist in Maternal Fetal Medicine, Urogynaecology and Gynaecology Oncology, and a team of generalists. Women’s and Newborn Services are undergoing a period of rapid change to a tertiary unit and are developing continuity models in maternity care, high risk obstetrics and innovative models of women’s health service across all areas of gynaecology. GCHHS has been accredited for Subspecialty Trainees in Urogynaecology and Gynaecology Oncology, Maternal Fetal Medicine application currently being prepared and the advanced trainee position for Australasian Gynaecological Endoscopy and Surgery (AGES) has been granted. The City of Gold Coast is the second largest city in Queensland. 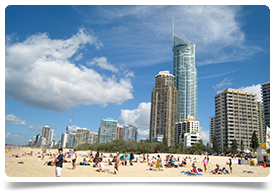 It is a thriving metropolis that also offers a relaxed beach-side lifestyle situated on the south coast of Queensland. Famous for its stunning beaches, sub-tropical rainforests and great entertainment options, the Gold Coast is one of Australia’s premier tourist destinations, attracting visitors from all over the world. While tourism has long been its key industry, the Gold Coast is also home to many other established and burgeoning industries, including sports, marine, information technology, education and health & medical. The Gold Coast offers a modern coastal lifestyle in one of Australia’s most desirable locations. The Gold Coast offers diverse residential opportunities, with homes and apartments overlooking the ocean or canals, through to rambling properties in the hinterland areas only 30 minutes from the CBD. With over 50km of beaches, World-heritage listed rainforests and National Parks on your doorstep, there is always something to explore in your time away from work. If you love sport, the Gold Coast is the place to be. It plays host to a diverse range of sporting events, from the Magic Millions horse racing carnival, the national rugby league competition, international surfing competitions, through to the GC600 V8 Supercar racing. Athletes from across the world will descend on the Gold Coast in 2018 when the city hosts the Commonwealth Games. Efficient public transport networks ensure easy access from the Gold Coast to Brisbane. The recently upgraded national highway ensures the two cities are connected via a short commute of one hour by car. The Gold Coast is also a gateway to other Australian and international destinations with its own airport.